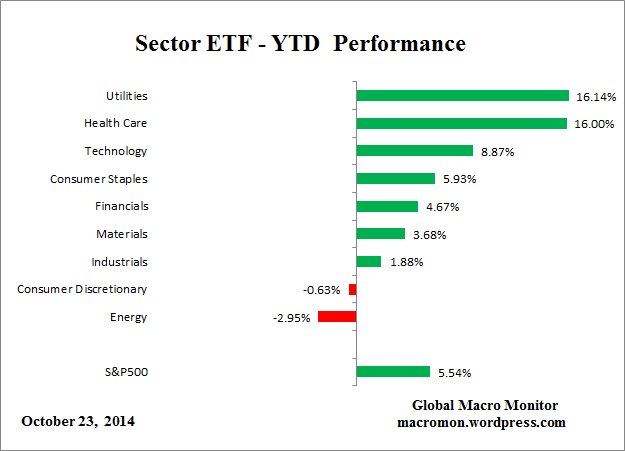 By various indicators, equities in 2014 align well with the last solar maximum year of 2000. 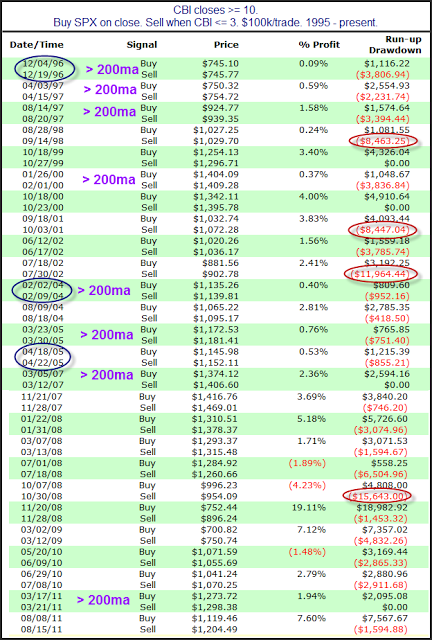 The July/Sept double top in price was higher in 2014 than the March peak (vs. lower in 2000), but the indicators reveal the topping process proceeding in the same way since the turn of the year. The extreme high banding in allocations aligns too. The October capitulative low failed to wash this out, just like in 2000. The long-tailed candle, rather than being a bullish development, instead appears as the first evidence of real selling befitting the end of a topping process. That makes the rally a rip to sell. The candle comparison unites with the positioning by indicators (solar max, topping process, margin debt, breadth, treasuries, sector performance, allocations), so it seems right. A negative November looks to be on the cards. Another surprising day. Strong bullish action in US stock indices with leadership by cyclical sectors and small caps putting new highs within reach on most indices, and actually achieved by Dow Transports. The monthly candle on TRAN is something to behold, fairly unprecedented in the last 2 decades. 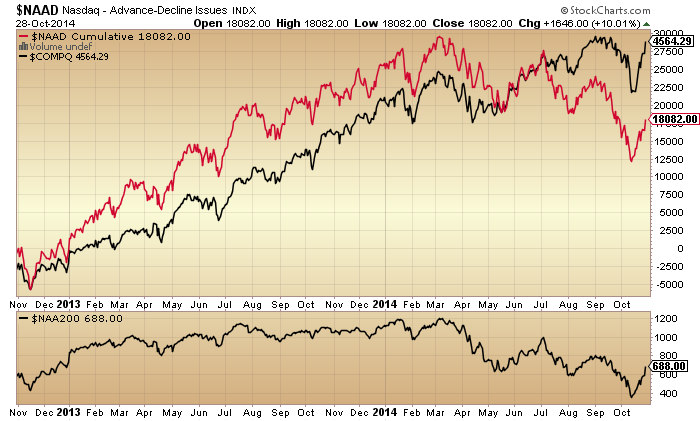 Ditto on the other US stock indices, which makes drawing on a historical analog for guidance difficult. With 3 sessions left in October, we would need to see a significant reversal to negate this current candle. Should that not occur, then I have to allow for the prospect of a continued bull market into year end, given the seasonal tailwinds, breakouts in Biotech, Apple and a decisive move back upwards in the R2K. However, I still rather see the weight of evidence as supportive of the wider markets having peaked, putting us in the early stages of a bear market. 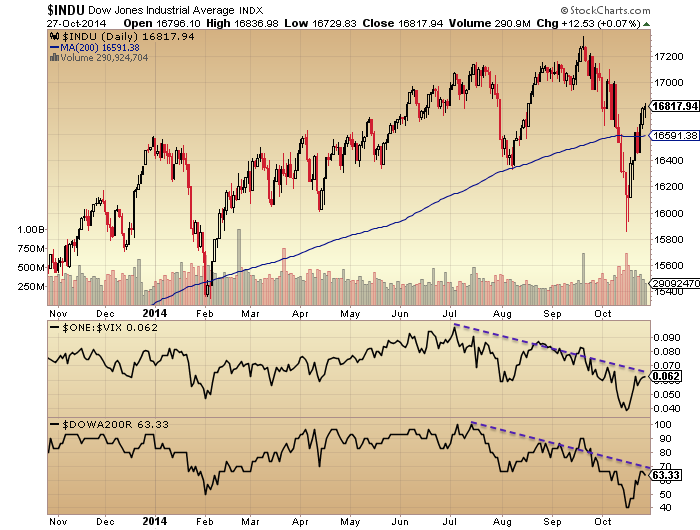 Turning to the US, here is the Dow (Industrials). We can see clear divergences in breadth and the Vix that still suggest we may have indeed made a switch from bull to bear at the start of July, but the price action is nowhere near as clear cut. Therefore, the rally ought to reverse today or tomorrow and the FOMC output may provide the trigger. Again, there has been little repair from this powerful October price rally. 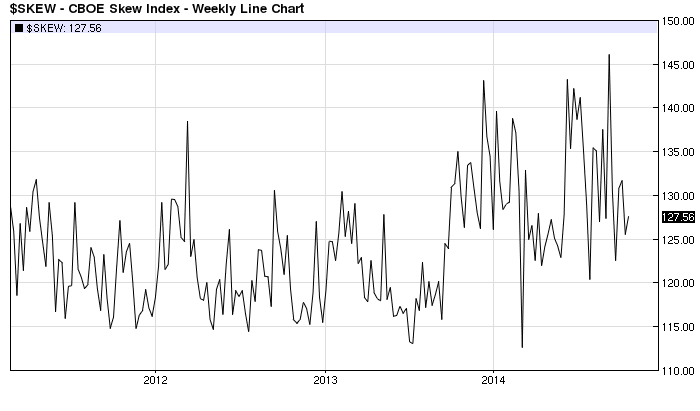 Skew remains in an extreme high band since late 2013, warning of an outsized move in price. These are all particularly mature flags now. 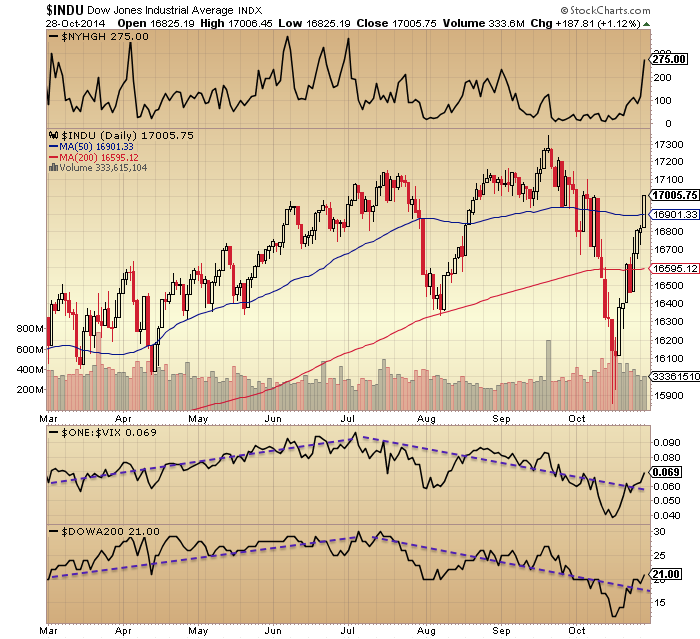 The key question is whether US stock indices can rally to new highs here and squeeze the bull market into year end. I have kept this as my worst case scenario for some time. 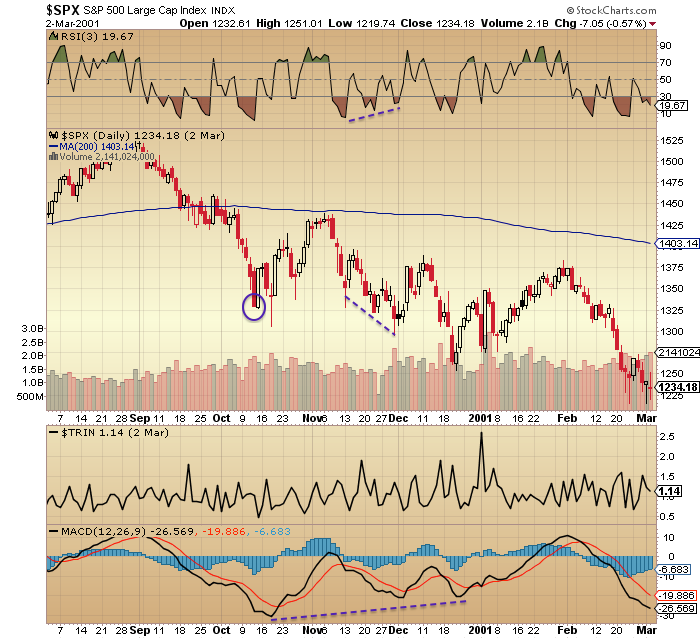 Given the mature divergences and topping indicators that have been in place since the turn of the year, it remains questionable that they can extend that far. When we add in the additional non-confirmations that have been in place since the start of July, the probability further shrinks. However, given the breakouts in certain stocks, sectors and indices and the power of the October rally, I have to respect that it could happen. For now, the weight of evidence still supports the smoothed solar max being behind us, along with the speculation peak in equities. The weight of evidence supports a topping process in stocks that began at the turn of the year and peaked in early July, and a bear market being in progress since then despite wild oscillations in price. If instead price can make new highs here (in US large cap indices), then indicators suggest that much like the September marginal highs they should be short-lived. However, given how overbought the rally has become, it appears likely that price should retreat before this week is out, which would likely create the missing lower high in US large caps. After that, we would then turn attentions to whether price can base above the October lows. My opinion on today’s FOMC is that it will be a market mover, and that they will stick to their QE exit. It seems the likely point for the markets to reverse back down, in a sell-the-news scenario, but given the power of the October rally, we will just have to see. Either way, the power has generally been in price, not in health. 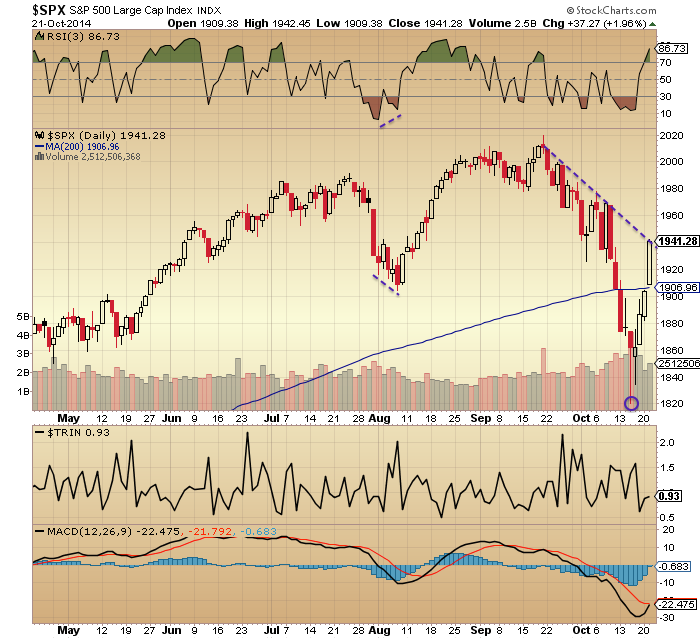 I see no reason to be bullish here unless many of those indicators and divergences can be repaired. However, we are once again at a crunch point, as this is about as high as we could expect for a ‘second chance’ lower peak. We have currently retraced 83% of the October falls on the SP500, exactly like the 1937 second chance lower peak. That, plus the Nymo and FOMC provides a set-up for a reversal here. No change in my positions until we see if that materialises. Sunspots and the smoothed solar maximum appear to have peaked around March 2014. Margin debt, Russell 2000, social media and various breadth measures look to have peaked around then, in a speculation peak epicentre, and all major global stock indices have tentatively topped out within 6 months of that. In line with previous solar maxima we are seeing a particularly hot year globally, with 2014 so far the joint hottest on record globally for land and ocean combined. Agricultural commodities may have a burst ahead of them. Equities have run away from the cumulative geomagnetic trend in keeping with a speculation mania over the last 18 months, whilst broad commodities continue to track the model. The geomagnetic trend just lately steepened downwards, in keeping with the seasonal geomagnetic peak time of year. This post-solar-maximum, geomagnetic pressure period is likely to drag equities down and maintain the peaks between March and September in the major global indices, implying we are in a new stocks bear market. I maintain the likelihood of the new moon reversal, i.e. that this week should now see the renewed move lower, making for a lower high in US large caps. 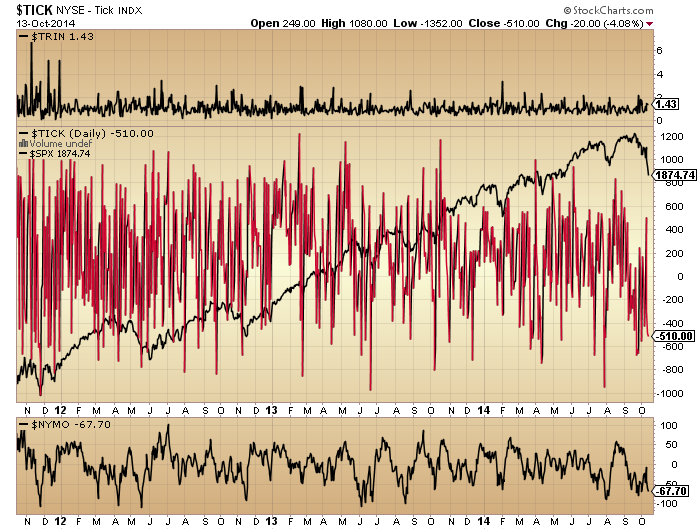 This probability is supported by the picture in Nasdaq breadth, which peaked out around March. 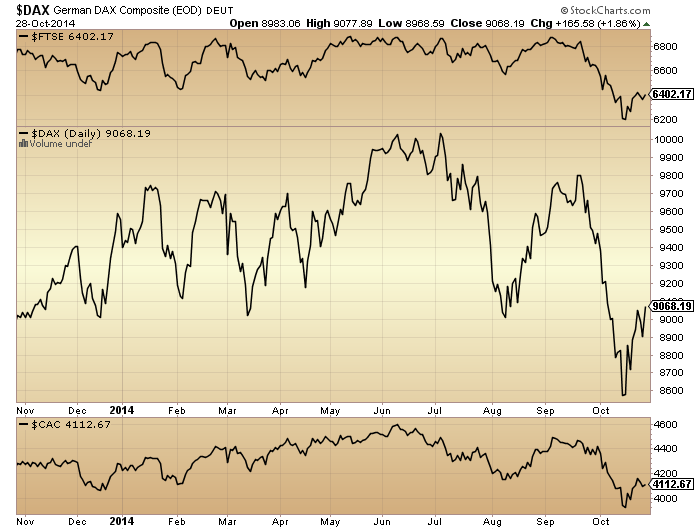 The European indices likely initiated the roll over yesterday. 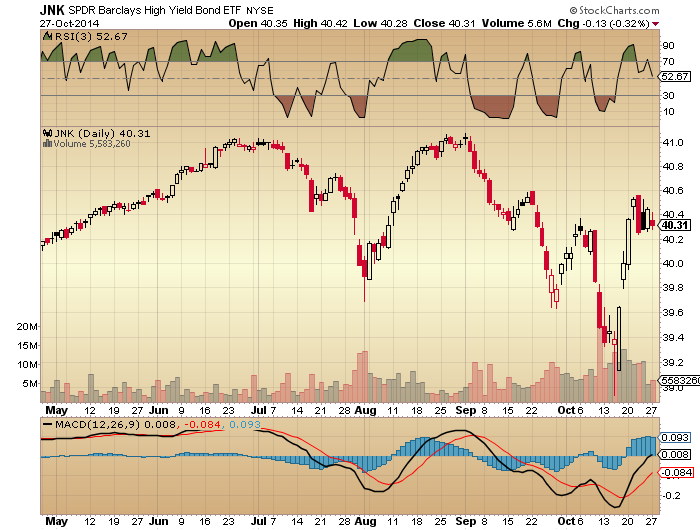 Whilst the junk bonds rally has possibly petered out the last few sessions. In summary, I still expect the markets to roll over here, providing the missing lower high in US large caps to go with the lower low (and existing lower highs in other indices). With a doji candle yesterday in US indices, a further doji candle today would provide the roll over set-up similar to 1987 and 1929. The likelihood of the Fed sticking with their QE exit in tomorrow’s FOMC output could then provide the trigger for the falls to initiate. The triple negative of the period into the full moon, the geomagnetic seasonal peak and the post-solar-maximum hangover provide the backdrop for this all to occur. I believe we are already in a bear market in equities but this isn’t going to be clear for a little while. Additionally it has made a 61.8 fib retracement of the Sept-Oct falls, and this is in keeping with the second chance peak of 1929 which was a 61.8 fib retrace of the initial falls. If that isn’t our current position, then we would be looking at a catapult to higher highs. 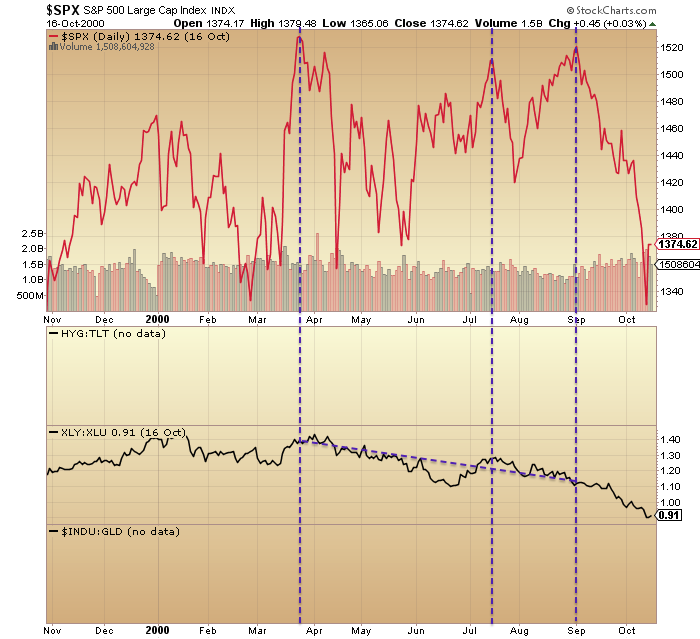 Ditto the reading in capitulative breadth that last week hit a ‘bear market bottom’ level. How do we reconcile those with (1) II bears still being at the (toppish) extreme <20%, (2) AAII bull-bear ratio back over 2 despite last week’s sell off, (3) margin debt and net investor credit still being at levels that exceed previous bull market peaks, (4) the average of 5 valuation measures putting us on a par with the 1929 peak as the second biggest mania after 2000, and (5) allocations such as Rydex and Fund Managers still being too high to have sustained a washout? 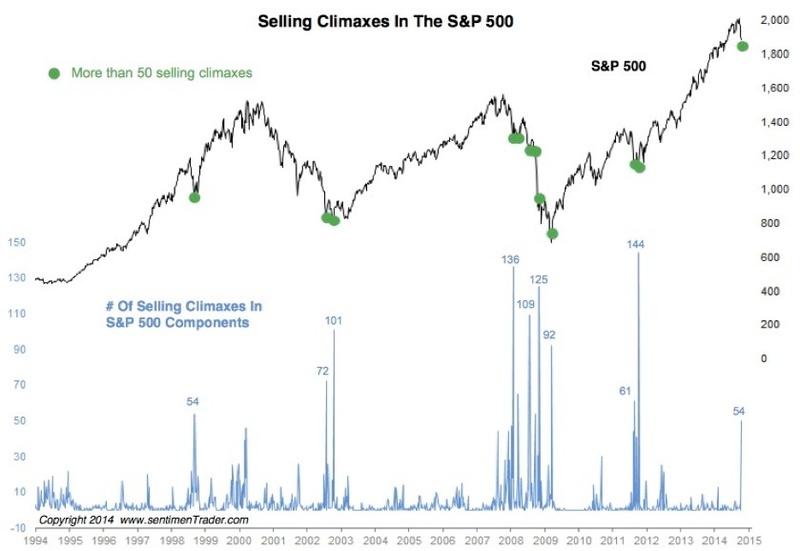 I believe we can reconcile if CBI and selling climaxes marked the bottom of the first leg down in a new bear market, because the sentiment, allocations, leverage and valuation indicators have a long way to go yet before they will have mean-reverted. The most probable scenario by solar models and data is that the smoothed solar maximum is behind us circa March time, and we can cross-reference that with the peaks in the R2K index and margin debt, i.e. it appears speculation did indeed peak then. 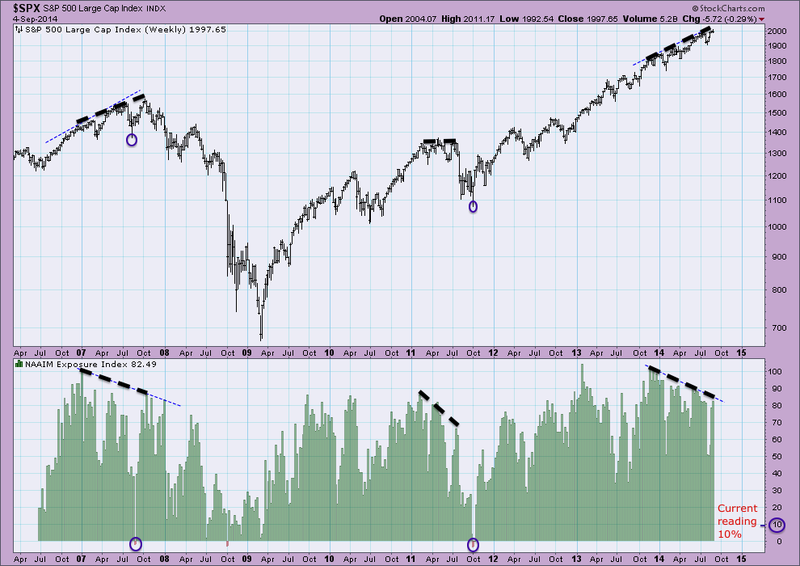 Generally, indicators reveal a 6-8 month topping process that ended in September, and this timeline fits with previous major peaks. Various indicators aligned already with the solar/market peak in March 2000, not earlier in the process. And through a combination of extremes in leverage, allocations, sentiment and valuations in the face of a demographic headwind, we appear to have reached saturation in the markets, i.e. questionable that there would be fuel to go some way higher yet. In essence, if we remove the solar maximum from the equation then we have a strong case for a topping process in equities that initially began 31 Dec 2013, had an epicentre around March, and completed by September. If we now add the solar cycle back in with most models pointing to a smoothed solar max behind us around March, then this looks doubly compelling versus the chance of a market peak delayed until 2015. 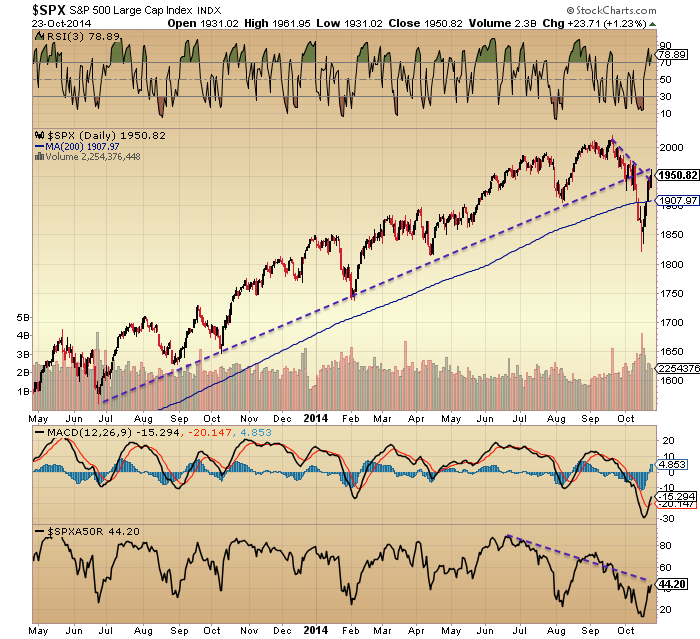 But, if I am to be proved correct, then equities have to now turn down again and not reach back up to new highs. Earnings growth for Q3 currently stands at 5.5%. This needs to be over 10% to justify valuations. Don’t take my word for it: analysts projections for this quarter at the turn of 2014 were 13% growth, but the reality means they were gradually reduced to 5% as the year progressed, so now in fact we have a little ‘beat’. I just don’t believe that is enough to propel equities higher, but rather, the gap between valuations and reality has been a flag for 2 years now and with three failure quarters out of three so far in 2014 that gap is at its biggest yet. Hence I believe the repair in price is now underway and we are in a bear market. 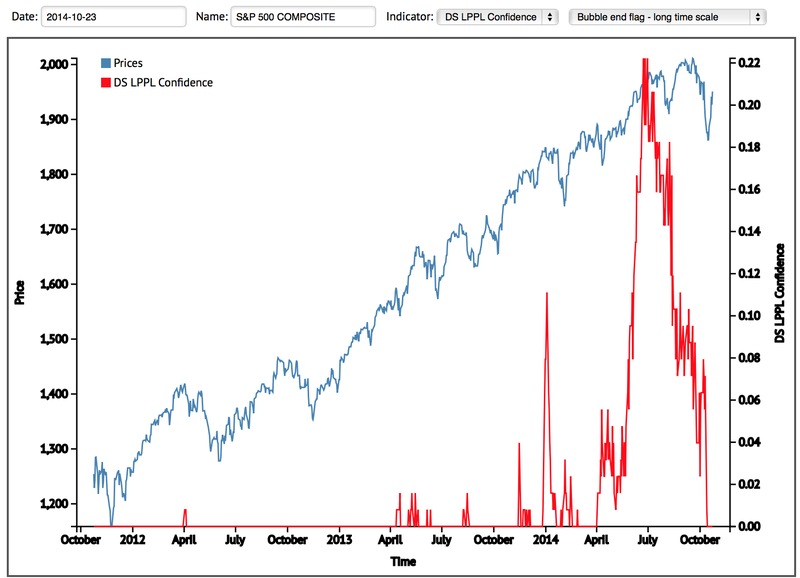 The Sornette bubble end flag still shows as July for the SP500 and September for Technology. 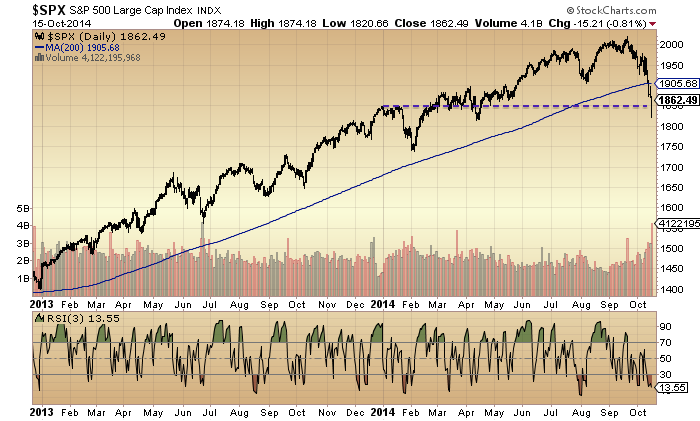 There has been no move back up with the recent rally. 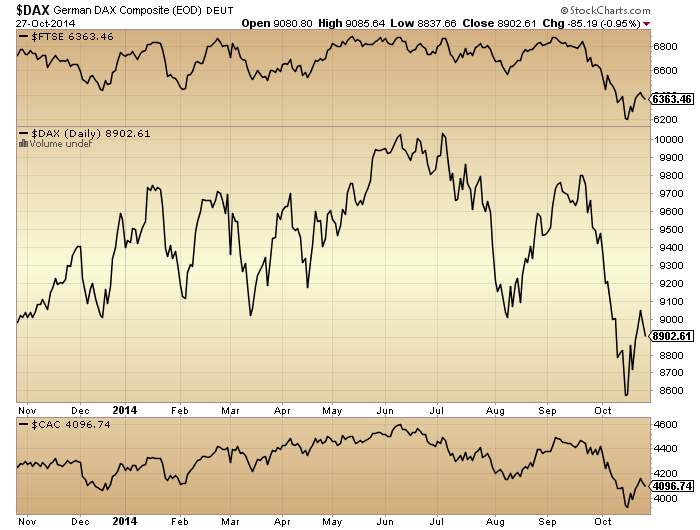 The European indices are bearish, unless the Dax can break back upwards here. 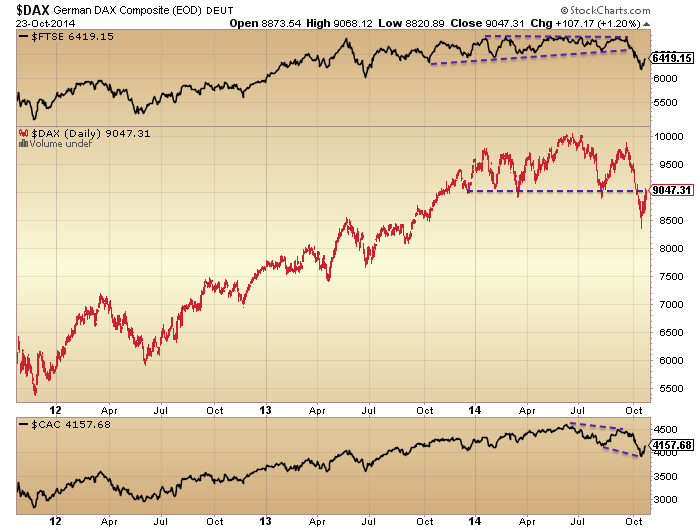 Rather it appears the ideal place for a reversal back downwards, along with the US indices. The pattern of a lower high and a lower low since June is fairly clear on the European indices and also on the Russell 2000 and the Bloomberg financial conditions index. What’s missing is a definitive lower high on US large caps, so that is what I am looking for. Uniting all the above analysis I believe this has to now occur and that we won’t rally back up to new highs. With the new moon now behind us and stocks arriving overbought and on negative divergences at suitable technical levels for a reversal I expect stocks to reverse back down to last week’s lows. 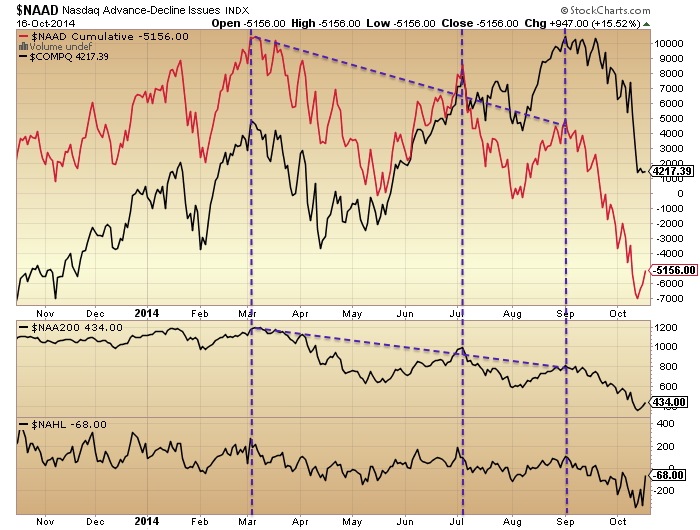 Once that occurs we can judge whether there is evidence of capitulation again and also of positive divergences. I believe there won’t be and that will be the trigger for the markets to then cascade lower. But first things first, let’s see if equities are repelled from yesterday’s peak. It took me by surprise that the R2K moved cleanly back into the 2014 range and the SP500 back above its 200MA in yesterday’s powerful up day. However, I believe odds are we still roll over here around tomorrow’s new moon only from a little higher up. That would make for a double fake: first below and then above the key technical levels. The weight of evidence still supports this being a second chance peak and that even if that is not the case then the market should first retest last week’s lows. Both corrections began measured then collapsed in capitulative style before rallying back up from the purple circles back to the more measured downtrend. If this is repeating then the SP500 should now turn down again and tomorrow’s new moon provides the ideal timing for a reversal. 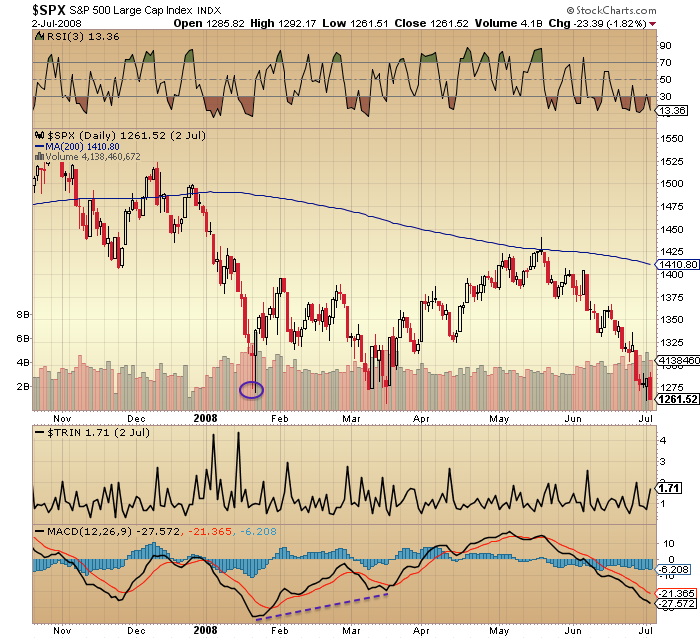 We can see how in 2010 the market based over a period with the MACD turning up. We lack such a stabilisation currently. 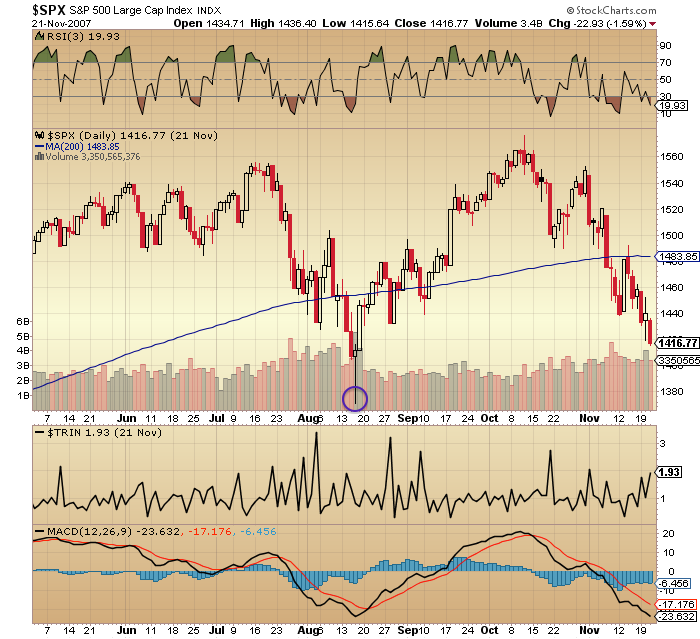 And in both instances price came back down to the lows, again stabilising against a rising MACD. So all three analogs suggest price should come back down to retest the lows and stabilise around those levels over a period. A rally all the way to marginal new highs from a single-legged correction. 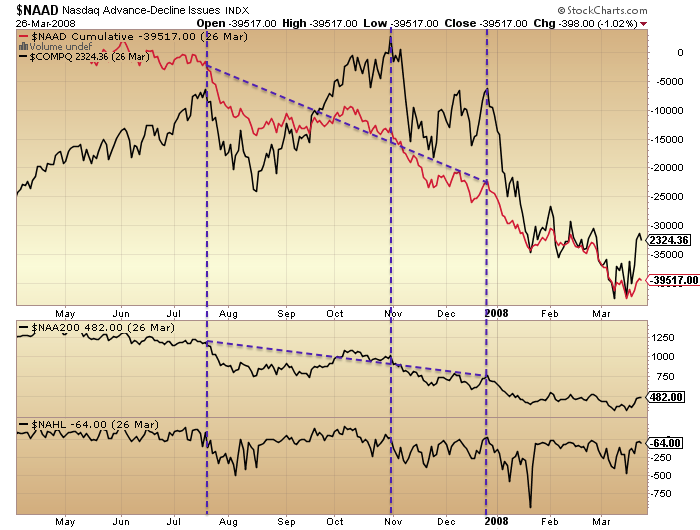 However, I remind you that this corrective leg was the start of the market topping divergences in 2007, whereas now we are mature in those divergences, equivalent to January 2008. Various indicator readings just don’t match up well with mid-2007. If we draw in the crash analogs, such as 1929 and 1987, then we are still in keeping with the second chance moves to a lower high before the true collapse, but only if we now roll over again over the next several sessions and head back down to last week’s lows. Crashes may not occur often, but I maintain that we have all the conditions in place for one to occur, and I stick with this being the most likely scenario: reversal around tomorrow’s new moon and then major crash into the beginning of November. Stabilisation to occur from much lower. If we are not heading for a crash then the three analogs at the top of the page show that we should still make a retest of last week’s lows. 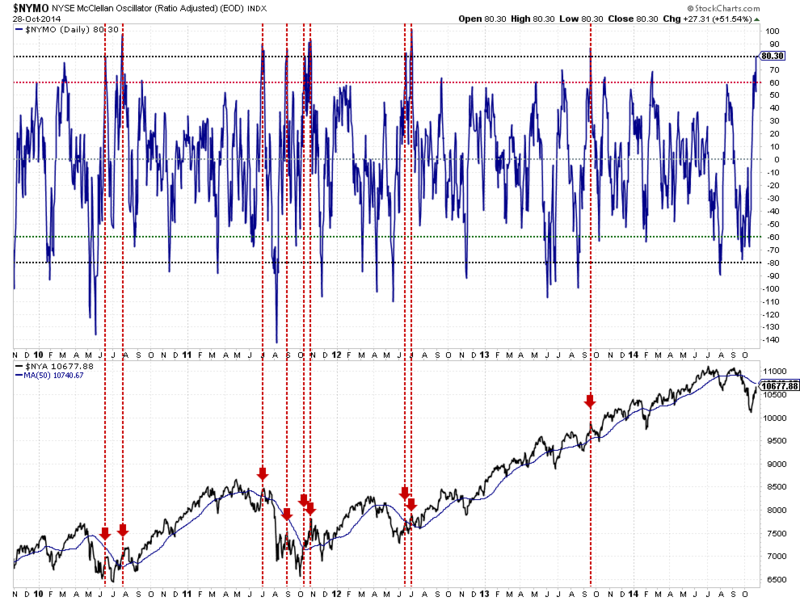 I think the mid-2007 analog has the slimmest chances of reoccurrence but it will become clear over the next several sessions as if something like that were re-occurring then stocks would consolidate yesterday’s break upwards and rally higher still. All the other analogs argue for a reversal back down without delay, and this still looks the most likely (geomagnetism is in progress, capitulative breadth is back to zero and various indicators are overbought), so I leave the analysis there for today and we see if that occurs before the week is out. If it looks like we are rolling over again then I will add again to the short positions. Earnings season continues. So far from those who have reported, EPS growth in Q3 is 5%. I remind you that the projection for this quarter was 12% at the start of the year, down to 9% by mid-year and most recently cut to around 5%. To justify equity valuations, earnings growth needs to come in at over 10% each quarter. Q1 came in at 2.2% and Q2 at 7.7%. If we stay at around 5% this quarter, then average earnings growth this year is less than half that required. In fact, this has been the theme for 2.5 years: price front-running a return to solid earnings that has not materialised. Consequently, valuations are at the historic extreme, and the pending repair in price I believe is now underway. When this occurred in 1937, the repair took 8 weeks post-solar-maximum and dropped equities by 38%. Up the stairs, down the elevator, both ways assisted by the sun’s influence. In the last couple of weeks we saw the technical price breaks: the Russell 2000 breaking down from its 2014 range and the SP500 making a lower low beneath its 200MA. However, by mid-last-week we saw some washout in indicators from which a relief rally in price erupted into Friday’s close. However, I believe this will be short-lived. 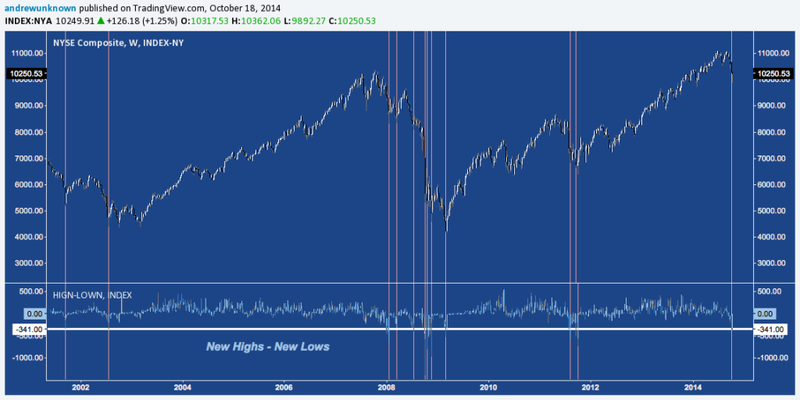 New highs-new lows turned negative, other historic instances shown below. Another price low ahead is the most likely. If we zoom in on the second chance we can see it amounted to just several days of relief rally. What I suggest could occur is a little more upside at the start of this coming week (CBI neutralisation), followed by a move back down towards the lows of last Wednesday (which can be slightly higher or lower), aided by the forecast geomagnetism and in line with typical stabilisation basing patterns (10% corrections are typically not v-bounces, and typically involve Trin spikes and positive divergences before rallying – both missing so far). If a true low is to form there, then we should see positive divergences in indicators and more evidence of washout or capitulation. That would then provide a firm base for a rally. However, if we see no positive divergences or capitulation evidence then we should break lower, and that removal-of-doubt in buy-the-dip potential ought to be the catalyst for the panic selling. The period at the end of October into the full moon of November 6th would be the most appropriate window for this to occur: negative lunar fortnight, geomagnetic seasonal low, post-actual-geomagnetism, and of course post-solar-maximum. 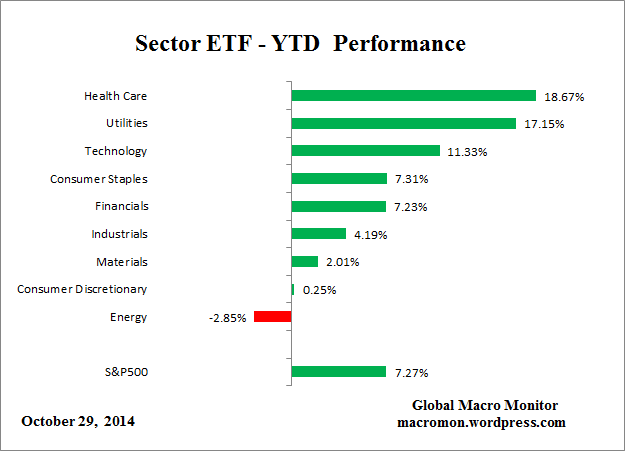 After that we have a window into year-end in which seasonal geomagnetism provides tailwinds for the market. So I am suggesting that either the market stabilises at the decision point shown above and rallies back towards the September highs into year end, or the market collapses at the decision point and crashes before a relief rally erupts into year-end from a much lower level. The weight of evidence supports the latter, but indicator readings at the decision point, should we get there, will provide further clues. 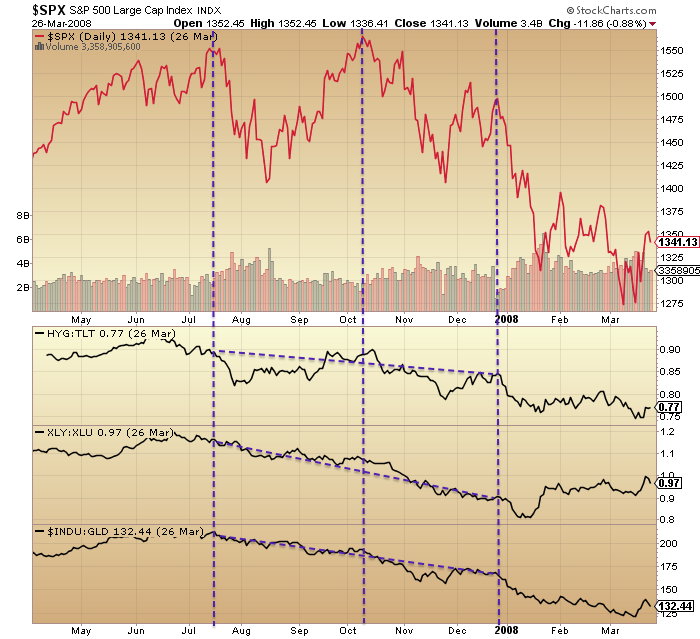 I remind you that certain indicators have a long way to go before we could argue for capitulation and washout. Indicators such as Investors Intelligence, asset allocations, valuation measures and leverage measures. A large magnitude drop would be necessary to correct these imbalances. I also remind you that we are now (very probably) in the period post-solar-maximum whereby the preceding mania turns into the resulting crash (Nasdaq in 2000, Nikkei in 1990, gold in 1980). 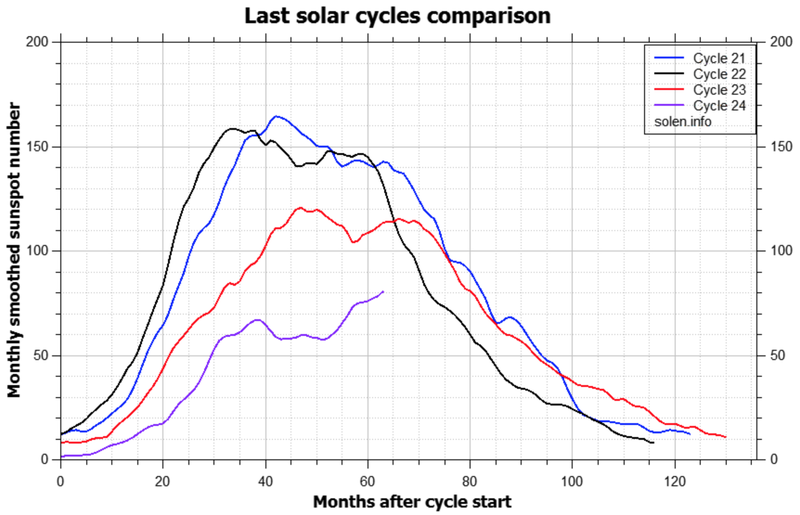 A crash was the norm in the last 3 solar cycles, not the exception. It may be index-specific, but so far no index has crashed. The most likely candidate for the heaviest falls remains the Russell 2000, I believe. A 14 year outperformance versus large caps, climbing to a mania into the 2014 solar maximum to its most expensive ever valuation and a p/e of over 100. It has broken down from a likely topping formation and is now attempting a backtest of the breakdown. A repel here should cement the new bear market, and generate the major sell-off. Invalidation of my case would be a break back up into the 2014 price range. The most common idea I’m reading on Twitter currently is that the current stock market correction is an echo of July 2007, implying a rally back up to marginal new highs may be next. However, these traders are mistaken in where we are in the topping process. Comparing 2000, 2007, 2011 and 2014 tops, here are two measures of Nasdaq breadth: cumulative advance-declines and stocks over 200MA (the latter not available for 2000). 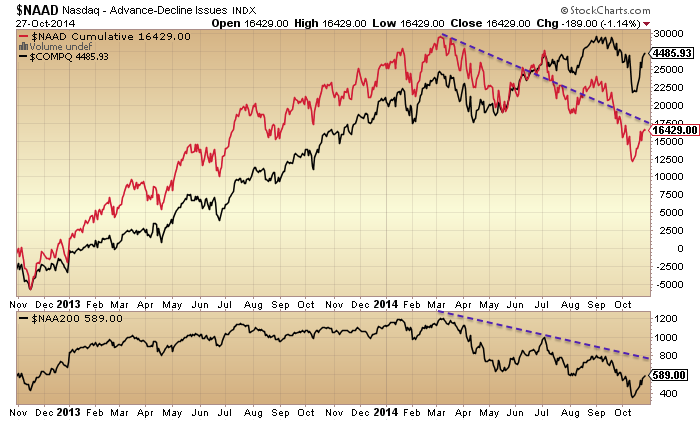 Breadth diverges at stock market peaks. 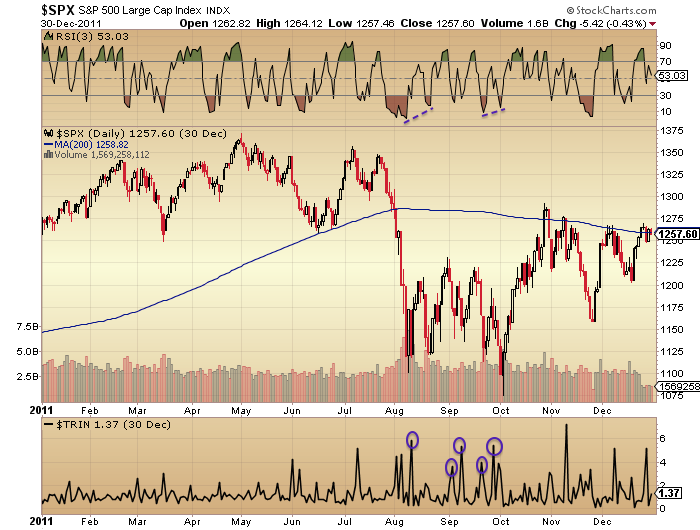 All 4 periods saw a topping process lasting around 6 months with 3 Nasdaq peaks. 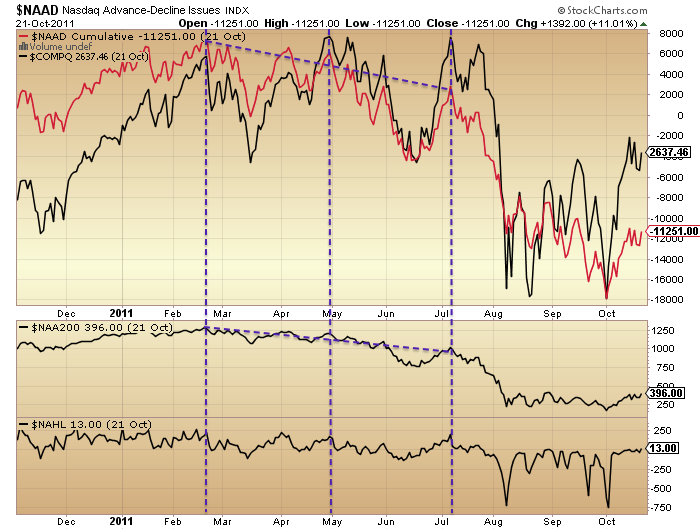 Over the 6 months and from the 1st to last peak we saw consistent degradation of breadth. 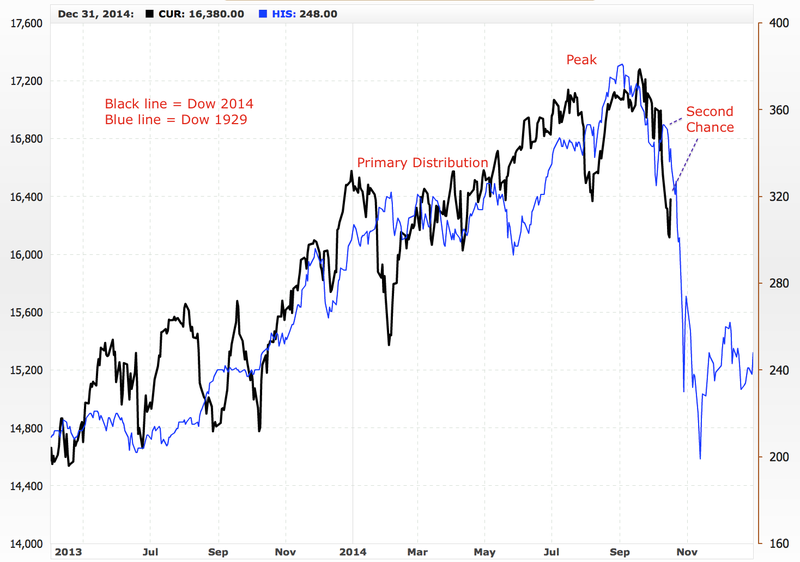 The last chart shows that here in 2014 we have also seen a 6 month topping process with 3 Nasdaq peaks and both breadth measures diverging from the 1st to the last peak. 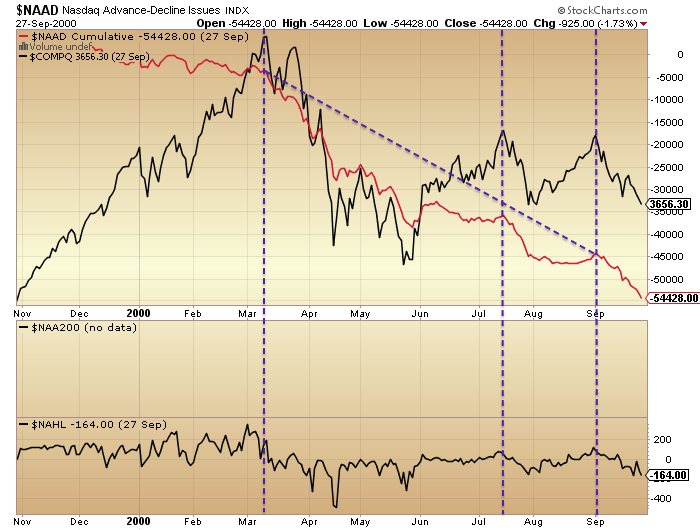 If we were now in July 2007 then we should be at the start of the topping process, about to begin the breadth divergences. 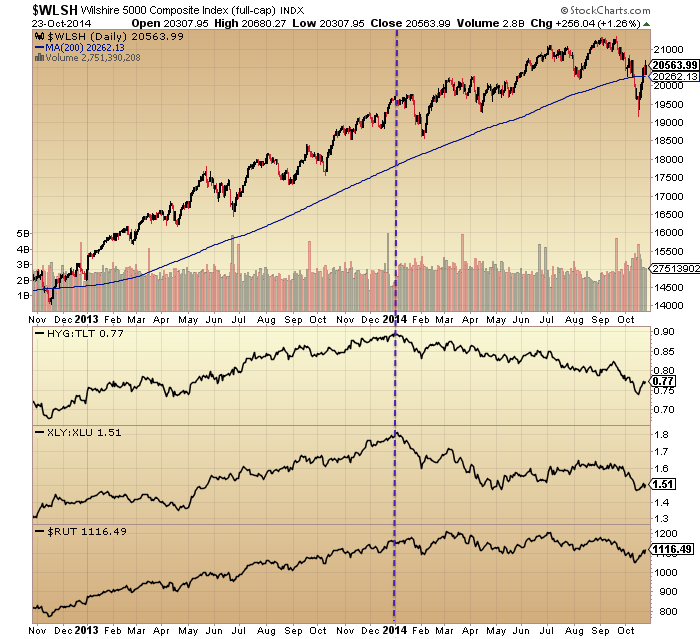 Instead the comparisons put us at the end of the topping process, akin to December 2007. 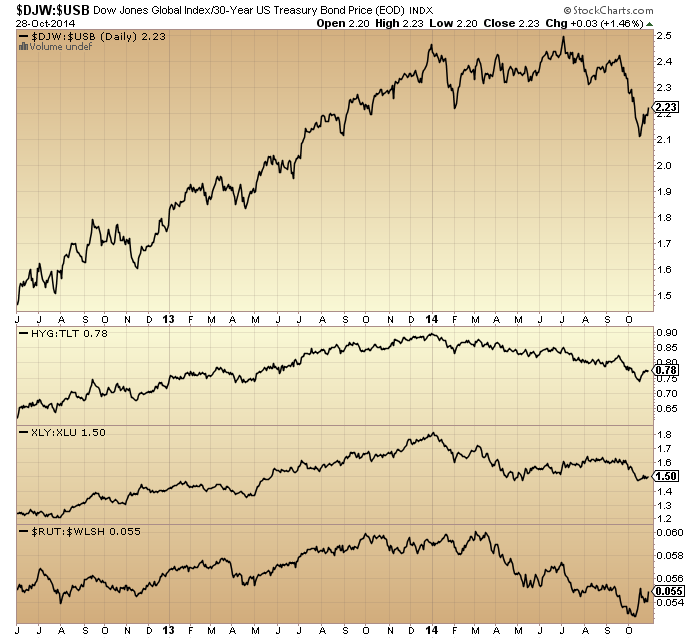 Next, here is the SP500 versus three different indicators of a market peak: high yield bonds to treasuries ratio (not available for 2000), consumer discretionary sector to utilities ratio, and Dow-gold ratio. They also all typically diverge during a topping process, showing an underlying shift to defensives. Once again we see in all periods the 3-peaked 6-month topping process, and the divergences beginning at the 1st peak and completing by the final peak. 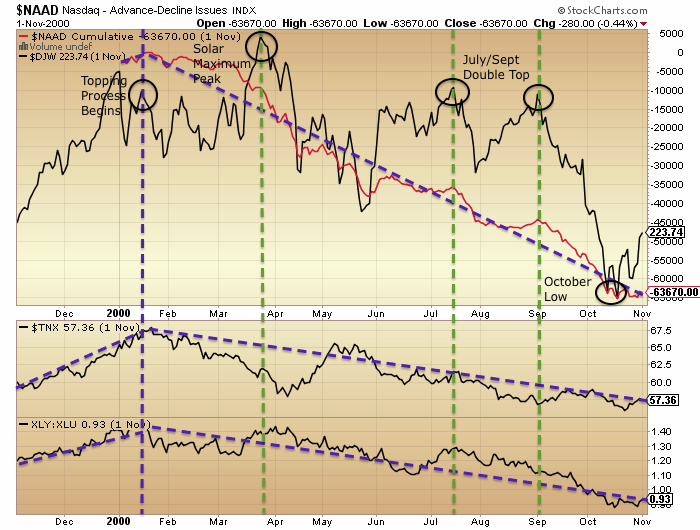 The last chart shows 2014 has produced an anomaly in the Dow-gold ratio (it is flat, rather than down, for the year), but the other two indicators mirror the previous peaks, and again their progression would put us in December 2007 not July 2007. I’d like to stress I don’t think 2007 is the best mirror (in case you are now studying the action post December 2007). 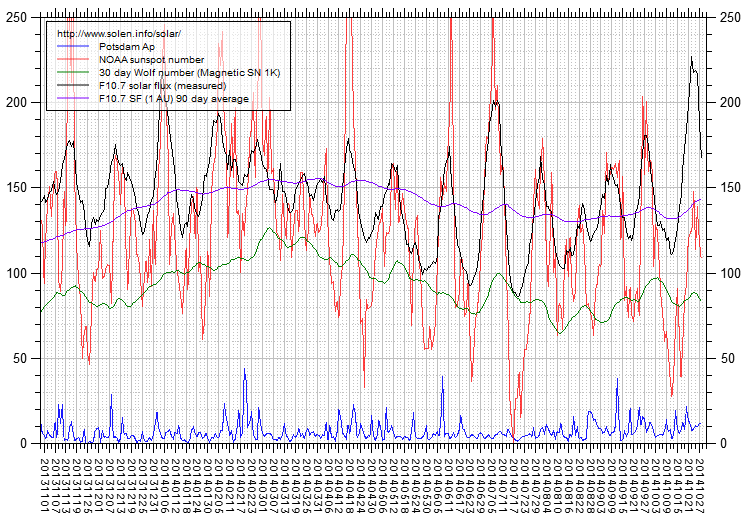 2000 was a solar maximum like 2014, and shows marked similarities in Rydex and Q-ratio, amongst others. I have made a case that 1937 is the most appropriate mirror from history, but most indicator data does not stretch back that far. Rather, my aim here is to disprove the idea that we are at the beginning of a topping process. Next, here is margin debt. Whether we measure from real margin debt peak to real SP500 monthly peak, or from nominal margin debt peak to the end of the nominal topping process (the third peak), the range is between 3 and 7 months from margin debt peaking to the market beginning major declines in earnest. 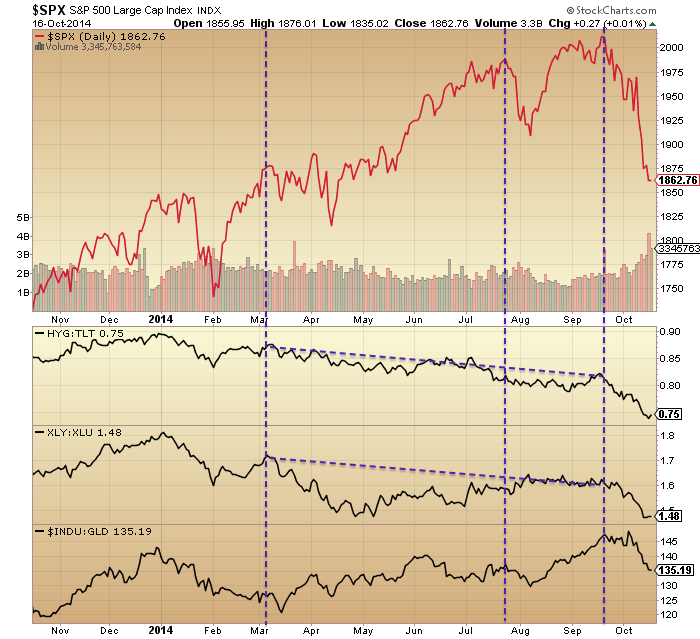 So it is another leading indicator, or divergent during the topping process. In 2014, margin debt peaked in February and given market declines in September and October we can be confident that peak will continue to be honoured. 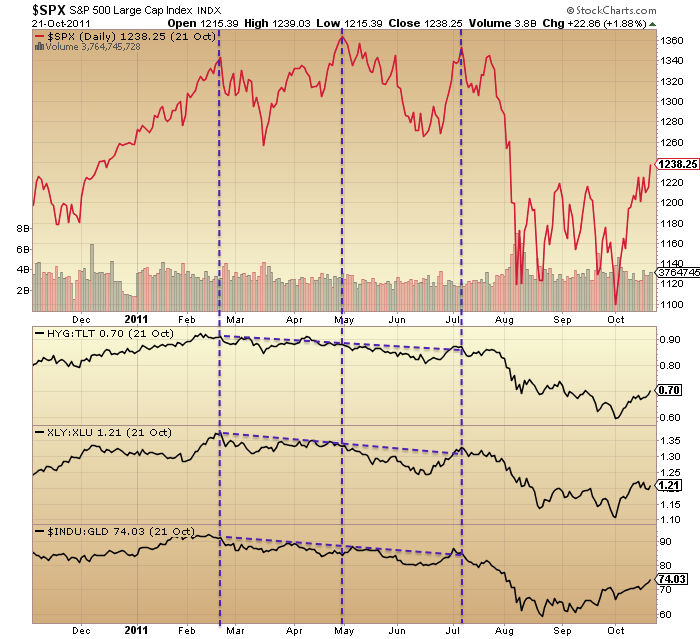 This again makes a case for stocks now being at the end of the topping process, tipping into the major declines. And lastly, NAAIM manager exposure to equities is also doing the rounds on Twitter currently, due to the latest reading having sunk to 10% (note this chart below is from 4 Sept so I have added the latest reading). 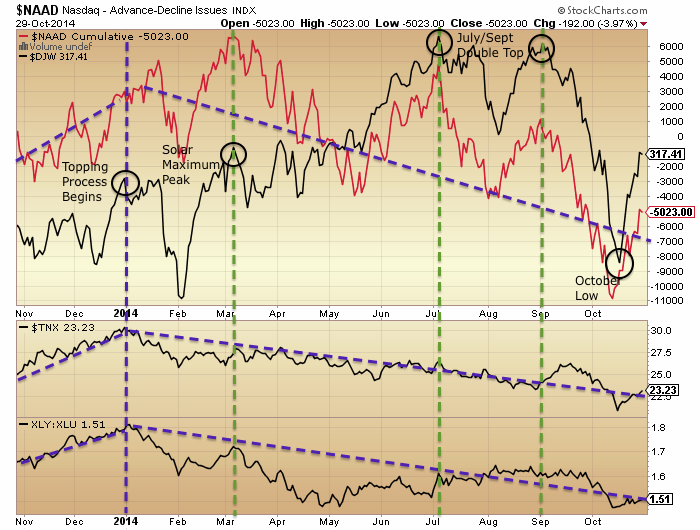 The chart shows that NAAIM is smart money, or again a leading indicator / divergent during the topping process. 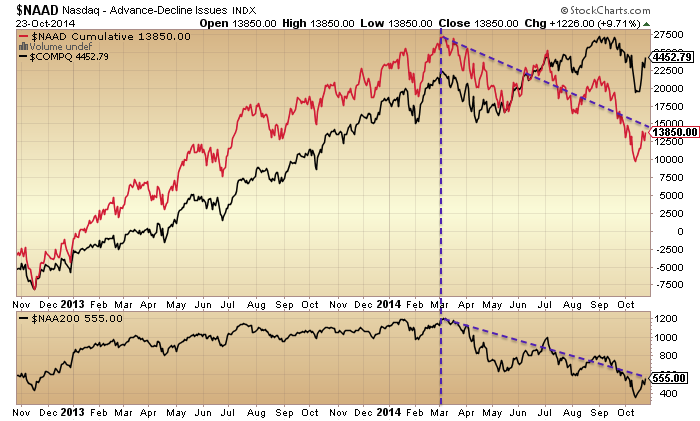 The period of divergence in 2014 echoes that in 2007. Once again, this suggests we should be at the end of the topping process, not the beginning. 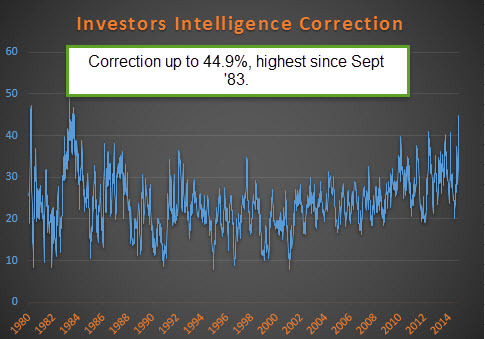 We can see that NAAIM actually went negative in the corrections of July/August 2007 and Sept/Oct 2011, so lower than +10% is possible, but rare. We can also see that in January 2008, just after the topping process completed in December 2007, NAAIM dropped sharply to just over 10%, and this in fact reflected the true start of the bear market, rather than a washout buying opportunity. Given the other indicators above would also position us in January 2008, and around 40 indicators called a bull market peak this year, then this is also most likely the tipping point into real bear market declines, not a buying opportunity. Finally for today, just a quick note on the 64-month bubble idea (this article). Cal referred this latest update to me and WT suggested the same conclusion that I will. 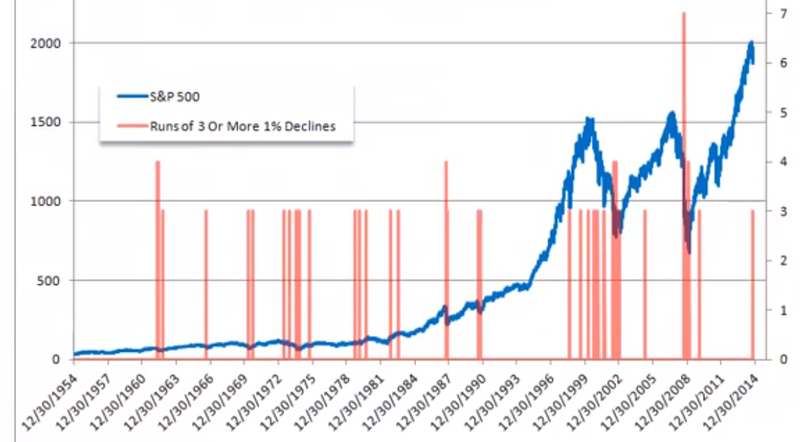 The writer claims that bubbles last 64-65 months from start to peak. Having done my own calculations, I argue he has used some artistic licence, because the range of his examples are rather from 36-85 months. Various start dates that he has used are highly questionable. Nonetheless, if we give him some leeway then the range could be tightened up to perhaps +/-10 months around 64, and this broadly fits with the period from solar minimum to solar maximum, or from a speculation low to a speculation peak. Some of his examples are exactly that, e.g. 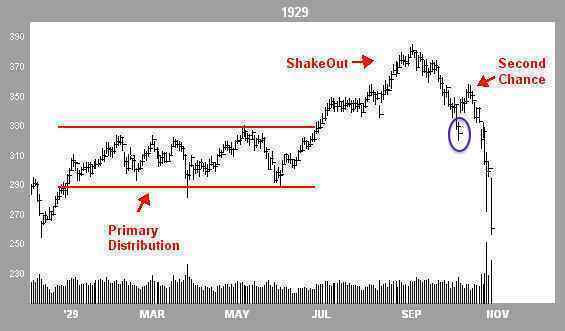 the Nasdaq into 2000 or the Nikkei into 1989. He doesn’t have a compelling reason for why bubbles would last 64 months, and that’s not good enough for me. Whatever the discipline or angle, I want to see a correlation and a scientific or logical reasoning for it. So in short, the data suggests a range for bubble durations, making his quote an average at best, and it fits the solar cycle duration, for which we have evidence of biological effects on humans that cause fluctuations in excitement and speculation. Ultimately, trying to time a peak using a 64-month calculation is likely to fail. To the markets short term. Yesterday produced a doji candle in US large caps so we roll over to today. The balance of evidence still suggests we are post-second-chance, or post-3rd-and-final-peak in the above analysis today. Therefore, there should be no rally back up towards the highs and I believe we will soon engulf Wednesday’s candle to the downside. What today’s analysis shows is that the anomaly is in price here in 2014, in that the July and September highs were higher highs in the SP500 and Nasdaq, making for what looks like an uptrend rather than a 3-peaked topping process. But in fact the behind-the-scenes indicators reveal the topping process and that those September highs are equivalent to September 2000, December 2007, or July 2011. Much later in the topping process than many analysts think. What’s also important to note is that those three topping processes all involved a decent correction during their formation, whilst in 2014 a meaningful correction has been avoided until now. That implies we have stored up a mega-correction, and this idea has support from indicators such as Investors Intelligence, Skew and Rydex which have been held at major extremes this year, like highly stretched elastic bands. Therefore, not only are we now most likely already in true bear market declines, but there is a strong likelihood of a crash akin to 1929, 1987 or 2008 at the centre of those declines. Most analysts are going to be completely wrong-footed by what transpires. Recall that Rydex, margin debt, loan issuance, Investors Intelligence, fund manager allocations, household allocations and other indicators collectively revealed a situation of stock market participants being all-in on equities with totally lop-sided portfolios and having taken on as much borrowing as they could to further invest. 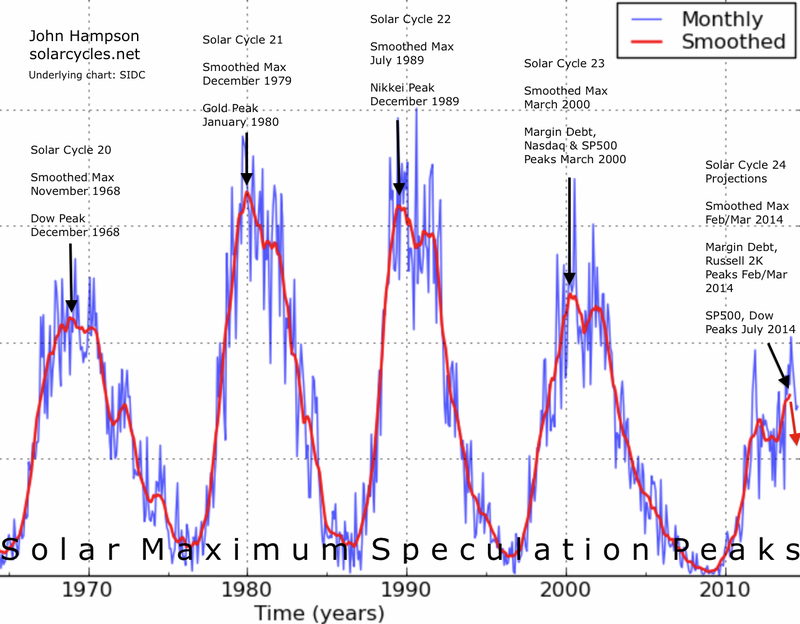 Maximum speculation as generated by the solar maximum. I referred to his before in trying to gauge ‘fuel spent’ for the stock market, as it strongly looked like we had reached saturation. Now here we are in Q4 2014 post-solar-maximum, with people unwittingly less keen to the buy the dip, and even less so at the seasonal geomagnetic sentiment low of October. 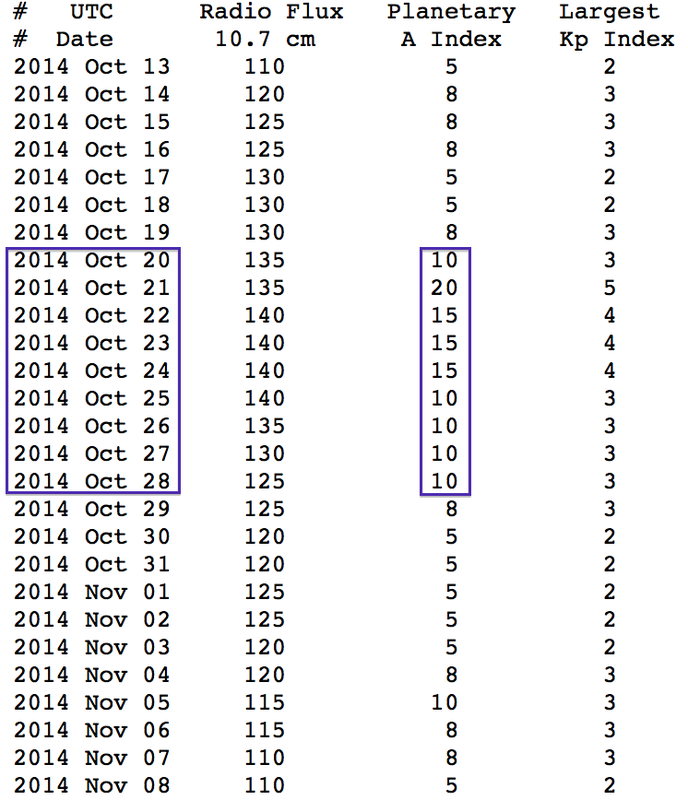 We saw a change in market character in September, at which point I believe the smart longs got out. 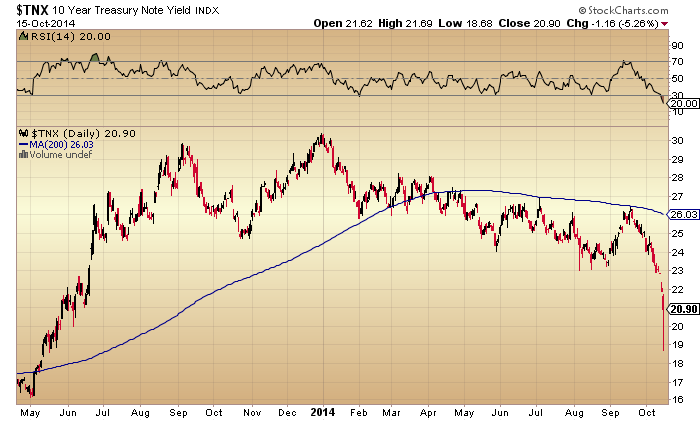 The falls in October to a lower low and sub 200MA cemented the new reality and the next level of players exited. The next development I believe is that we see no rally back up towards the highs but instead collapse further and sharper, at which point the remaining dumb money will be scrambling for the exits, resulting in a crash. Because, the point is, all those indicators collectively showed that we had reached effective market saturation: no bears left to convert, no more fuel to buy, and tremendous lop-sidedness. With a demographic headwind, the market needed the steep increase in leverage to push it higher, but this has to be fully repaid and history argues by way of forced redemption panic selling. Who will step in to buy and shore the market up? All those indicators plus collective demographics in the major nations suggest the queue to buy the stock market is now fairly empty. 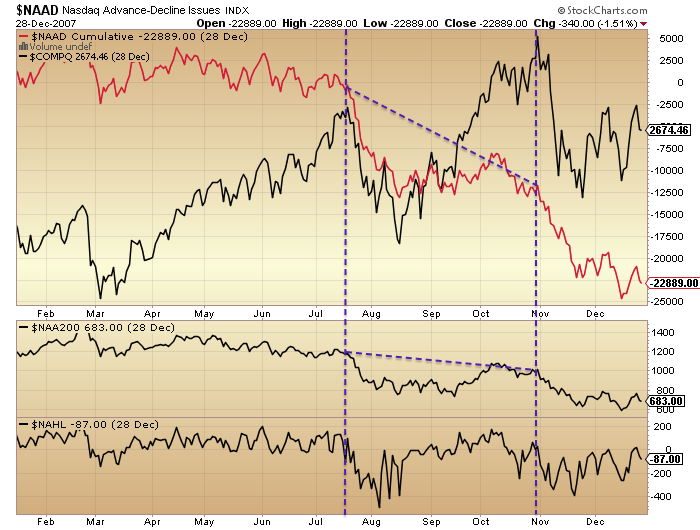 Therefore, the current trickle over to the bear camp, to selling and shorting, has very little counterbalance. Stock market declines should therefore come easy, and once the trickle becomes a flow, the market should accordingly crash. The dotted line on the top chart shows the YTD progress. The SP500 dipped negative yesterday and almost hit 10% down from the September peak, but closed at around 9%. By the range of my analogs, we should see a minimum 18% correction, so that’s not enough. 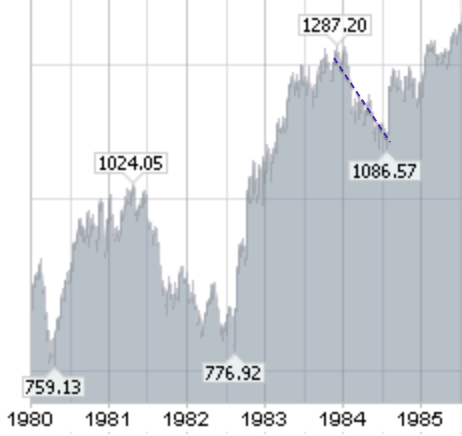 Rob Hannah’s capitulative breadth hit 19, an extreme level associated with bear market bottoms. The initial reaction to that is that it sounds like a golden opportunity to go long, but the considered reaction, IMO, is that given we are just 9% and 1 month down from all-time highs, this time is clearly different. He doesn’t reveal his formula so the analysis has to stop there, but we can look at other indicators for more clues. Yesterday’s selling did not appear exhaustive as small caps held up well. 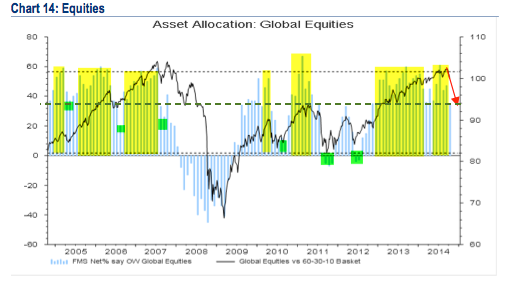 As the highest risk equities class, this runs counter to previous capitulative sell-off examples, such as in 2011. That suggests there should be another sell-off ahead in which small caps participate. Drawing together 2010 and 2011, we can see that intraday hammer candles did not necessarily mark the bottoms in equities (red circles). However, if yesterday’s hammer was indeed a bottom then we should be heading for a retest and likely lower low on positive divergences as momentum wanes (purple circles). If we look at the 1929 analog and assume we are not post-second-chance but at the purple circle, then a few days’ bounce before rolling over again would mirror not only 1929 but also the action after the first purple circles in the 2010 and 2011 charts above. Evidence, however, suggests that we should be post-second-chance, and so far, the steepening downtrend in price is supportive of that. If that is so, then yesterday’s candle should be quickly engulfed and a much bigger panic sell day should come to pass within days. So, either yesterday’s hammer candles are quickly engulfed over the next couple of days, like the red circles in the 2010/2011 charts or post-second-chance in 1929, or we rally for a few days (perhaps into the October 23rd new moon) and then turn down again to the lows, like the purple circles in 2010/2011/1929. A v-bounce back up towards the September highs would be anomalous and only have support from the CBI, which itself has produced an anomalous reading. The Russell 2000 outperformed the last couple of sessions, but has broken down the most of the indices overall. It would need to quickly recapture the 1100 level to keep any consolidation hopes alive. Otherwise, the bears are in control. 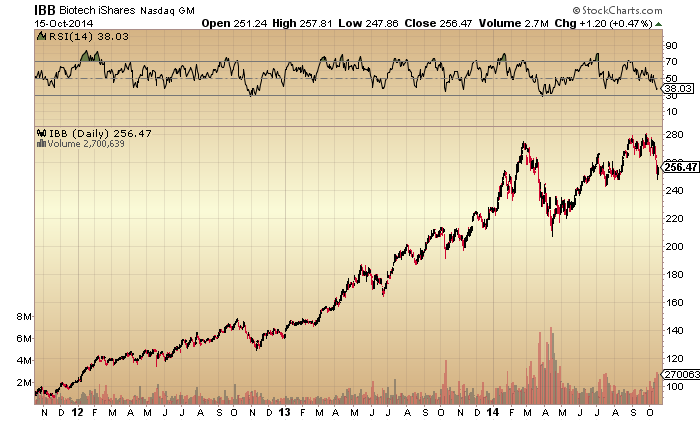 Biotech now looks to have been turned down at a double top with February. 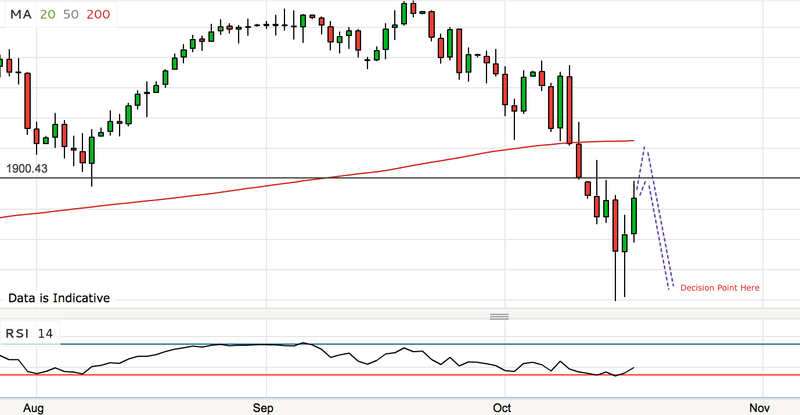 Apple tentatively broke down from a 6 week trading range yesterday, but the pull up into the close keeps it tentative. To sum up, the most bullish scenario is that we rally for a few days then retest yesterday’s lows again on positive divergences. The most bearish scenario is that yesterday’s range is swiftly engulfed by the bears over the next couple of days and a much bigger panic sell-off ensues. No panic selling follow-through from Friday in the Asia and Europe sessions yesterday but weakness hit late in the US, producing the third consecutive >1% down day, taking the SP500 7% down from its peak, and strengthening the steepening down trend. It keeps us on track for tipping into the panic selling, per the analogs, unless the bulls can stop the rot and generate a relief rally, so let’s see how the indicators stand. 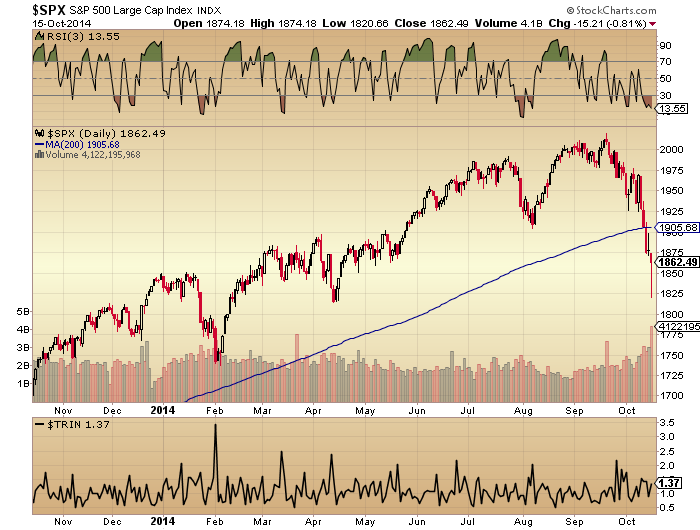 The SP500 sliced through the 200MA with little resistance. 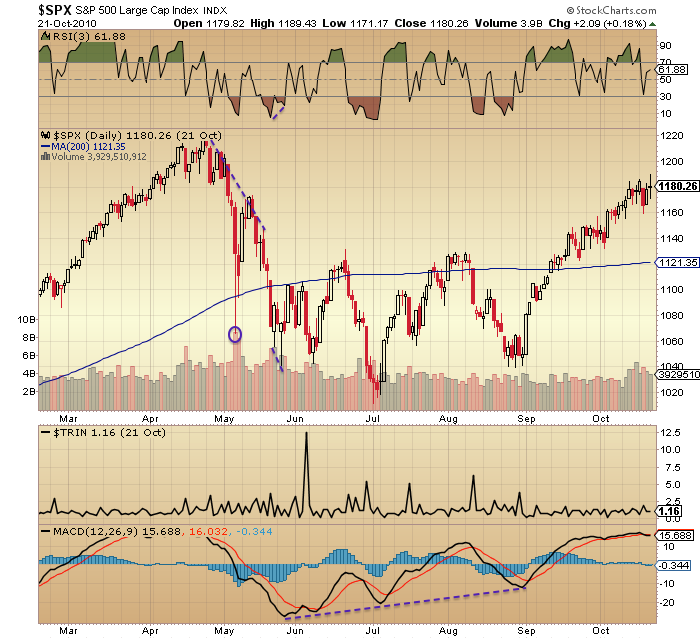 The positive divergence on the RSI has been negated with yesterday’s move. A drawdown was fairly common, sometimes large, before mainly positive results. 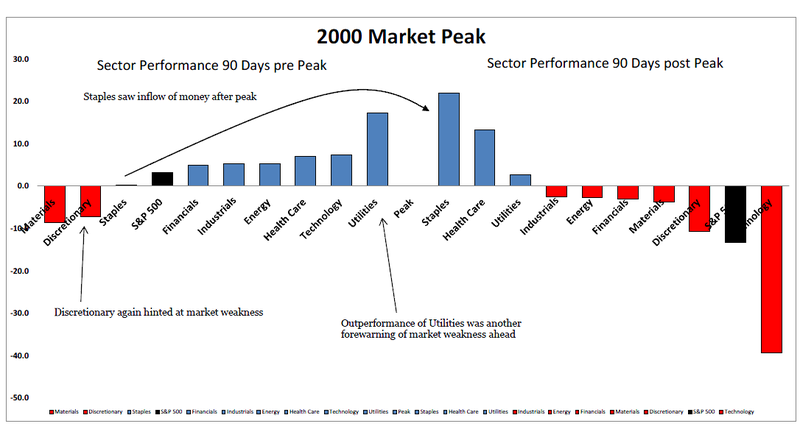 All year the top two sectors that are associated with post-market-peak outperformance have been signalling a top, but now their relative performance is much clearer to see. In summary, the arching-over formation and the increasing bear pressure on the stock indices looks very similar to the waterfall decline analogs (see last post) pre-collapse. With all the major indices now having broken through their key support levels, the bulls need to step in fast to prevent a crash. The CBI washout is on their side, but there may well be further selling (drawdown) before the bounce, if it works again. 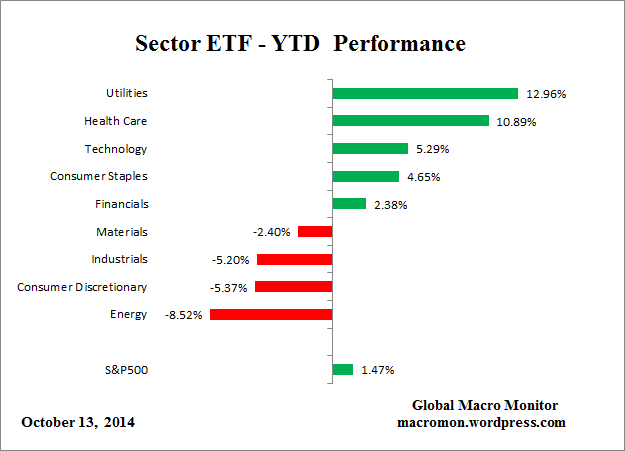 Other indicators are not at this point showing obvious exhaustion. Therefore, some more selling, to align indicators at contrarian bullish readings, seems the most likely, and a voluminous major distribution day, perhaps that ends as a hammer candle (intraday reversal), would further increase the odds of a bottom, if it is to come. The question is whether some further selling here can be fairly measured and contained, or whether it would quickly spiral out of control to become a major crash day (or days), given the large imbalances in the market (leverage, bullishness, complacency, etc). Either way, I think the situation is looking fairly black and white now. Either we are cascading into panic-selling, per the historical analogs, and, having broken the key supports, that should now happen very quickly (this week if a collapse, or more sustained selling over several weeks if more like 1937). Or, the bulls can yet generate a relief rally to a second-chance peak (springboarding off that CBI) which should last a couple of weeks or so (drawing on the analogs again), before the market tips over in earnest. Right now the first option has the upper hand (closed at lows, sliced through supports, steepening down trend, a lack of alignment in indicators for exhaustion), so the onus is on the bulls to deliver something today or tomorrow.